UofL seeks to provide ever greater access to local, healthy, and sustainably produced food. Since 2016, UofL has hosted a Community Supported Agriculture (CSA) pick-up at the Health Sciences Center for those seeking to invest directly in a local, chemical-free, seventh generation family farm and to enjoy a share of the harvest! In 2018, we added a Belknap Campus pickup site as well. Learn more about subscribing to the Barr Farms organic CSA and sign-up here. You'll enjoy a weekly (or biweekly) delivery of fresh, local, USDA organic certified produce from May through October! They also offer a meat CSA option. Customize your CSA box based on the veggies you love and hate. Choose the size and frequency that's right for you: small, regular or abundant, weekly or biweekly for each size. Multiple delivery locations, including home delivery. Find a location close to your home or work, or ask us to set up a new one. 400 block of E. Gray St, between Preston & Jackson. Directions. 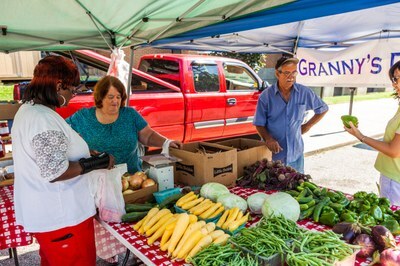 The Gray Street Farmers’ Market began in 2009 as an outreach program of the UofL School of Public Health and Information Sciences. Stop by at lunch time every Thursday (rain or shine) mid-May through October. 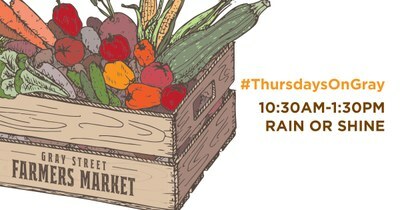 In 2019, the market will operate every Thursday 10:30am-1:30pm May 16 - Oct. 31, 2019. 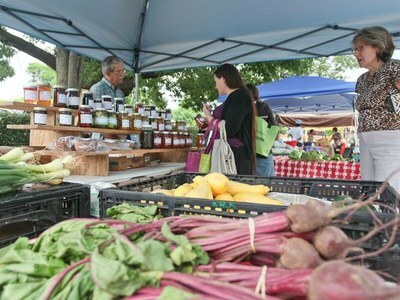 With 11 unique local vendors, you'll find the finest in farm-fresh local products, including fruits, vegetables, pasture-raised meat & eggs, popcorn, honey & syrup, jams, granola, bread & baked goods, flowers, plants, prepared lunches, food trucks, and more. Cash, debit cards, SNAP benefits, and Senior Farmers Market Nutrition Vouchers accepted! Access our collection of delicious recipes for local products. Watch Vendor Spotlights and recordings of our Monthly 20/20 Talks (a short seminar series on food and sustainability) on the GSFM YouTube Channel! Join our listserv and receive our weekly newsletter by sending an email to listserv@listserv.louisville.edu with the message “SUBSCRIBE GSFM (First_Name Last_Name)”. Easily accessible from Belknap Campus on TARC Route 18 (free with UofL ID) or via a pleasant 15 minute bike ride. The Belknap Farmers Market operated as a weekly May-October market from 2014-2016. 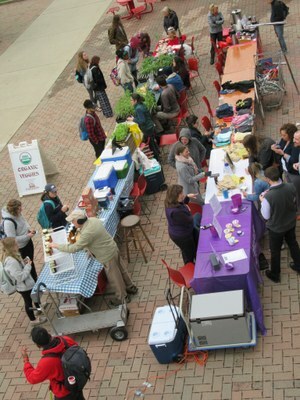 Due to difficulty sustaining the market over the summer months when fewer people are on campus, we have determined that the Belknap Farmers Market is most successful as a one-day Spring Market in April and a one-day Holiday Bazaar in November. You can follow us on in order to stay abreast of future markets. Louisville Grows: plant seeds and starts (veggies, fruits, and flowers) to help you get your garden growing! Barr Farms: taking subscriptions for their Community Supported Agriculture (CSA) local food subscription service with pickups available at both Belknap campus (SAC Health Promotion Office) and Health Sciences Center. Come meet the farmers and learn how you can enjoy a weekly (or biweekly) delivery of fresh, local, sustainably-grown produce from May through October! They also offer a meat CSA option. Eating Green Calculator - Get a handle on the impact of your eating habits and the benefits of eating differently! Local Purchasing: We support local farms and businesses, with a contractual requirement that at least 20% of all food purchases be sourced from within 250 miles of campus, including produce, dairy, meats, breads and baked goods. We continue to exceed that minimum and increase our local purchasing. Recent local food suppliers include: Creation Gardens, Piazza Produce, Klosterman's Bakery, Popcorn Station, Clem's Refrigerated Foods, Aqua Sushi, Dean's Milk, Sysco Louisville, and Heine Brothers. 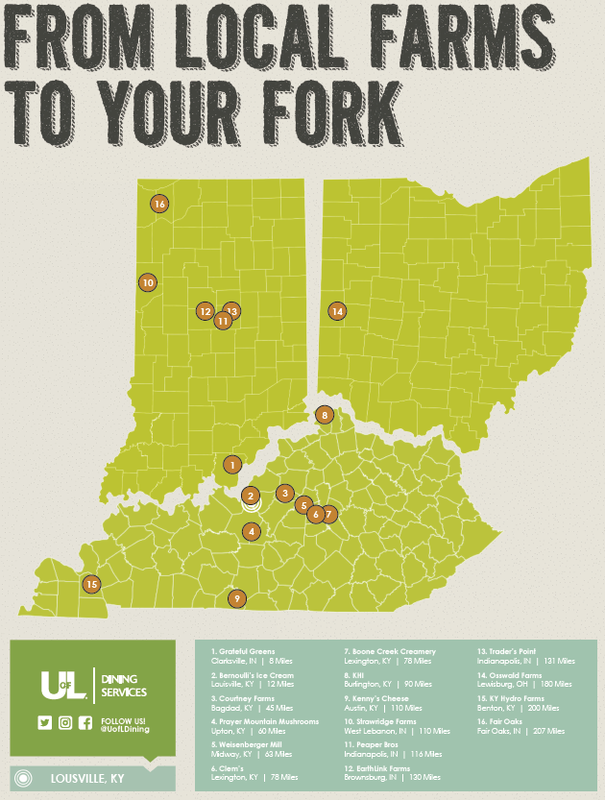 - UofL Dining Local Food = Amount of UofL Dining controllable food purchases sourced from a food producer, processor, or distributor within 250 miles of campus. EXCLUDES sodas, ice, and large agribusiness products (Kellogg, FritoLay, Conagra, General Mills, Pepsi, Armour-Eckrich), as well as food purchased by on-campus chain franchises and food trucks. - Direct Farm Impact = Amount of UofL Dining controllable food purchases sourced from a farm within 250 miles of campus. - All Campus Vendors Local Food = Amount of food purchases by UofL Dining plus on-campus chain franchises and food trucks that was sourced from a food producer, processor, or distributor within 250 miles of campus. EXCLUDES sodas, ice, and large agribusiness products (Kellogg, FritoLay, Conagra, General Mills, Pepsi, Armour-Eckrich). - Total Dining Local Purchases = Total amount of purchasing power spent by UofL Dining plus on-campus chain franchises and food trucks at businesses located within 250 miles of campus. Includes food and non-food purchases (supplies, construction, services, etc.). EXCLUDES sodas and large agribusiness products (Kellogg, FritoLay, Conagra, General Mills, Pepsi, Armour-Eckrich). Food Waste Composting: In 2010, we began a pilot pre-consumer food waste composting program in our main campus kitchens. Over 1000 pounds of kitchen waste was collected by volunteers and composted on campus each week, turning a waste product into valuable organic fertilizer for the campus vegetable garden and landscaping. In 2012, we went full-scale and now send as much as 6000 pounds/week of both pre- and post-consumer food waste to a composting facility in southern Indiana. Learn more here. - Explore your choices with our Vegetarian & Vegan Guide to UofL Dining! - Minimizing meat consumption and transitioning to a nutrient-dense, plant-based diet has proven to have tremendously healthy impacts on our bodies and our planet. The conventional meat industry is resource-intensive and exploitative. For one thing, a 2013 study by the United Nations’ Food and Agriculture Organization found that meat production globally generates more greenhouse gases than all the world’s cars, planes, trains, and ships combined. That adds up to an estimated 15% of total greenhouse gas emissions! By carefully considering what you put on your plate, you can make a big difference in your personal health and our global future. - Learn how to assemble a healthy meal with the UofL Smart Plate guide! The Louisville Cardinal has prepared this guide for how to eat healthy on campus. - The Ville Grill (3rd & Brandeis) provides numerous healthy options, including a salad bar; a vegetarian & vegan station with a menu dedicated to serving protein-balanced and nutrient-dense meals at every meal; and an allergen-free station which also serves as a great option for vegans, since processed foods are avoided and all are prepared with no milk, eggs, wheat, soy, shellfish, peanuts, tree nuts or gluten. - Healthy and Vegetarian options are available at nearly every other campus dining venue. Look for the special icons on menus around campus and check out our Vegetarian & Vegan Guide to UofL Dining! Nutritional Information: New online menus include nutritional information about every item. You can choose which meals to view and do a comparison to help you plan a healthy, delicious meal. Learn how to assemble a healthy meal with the UofL Smart Plate guide! Trayless, Non-disposable Dining: We offer trayless dining campus-wide and real plates, glasses, and silverware at The Ville Grill, our all-you-care-to-eat dining hall at 3rd & Brandeis (open to all students, employees and the public). This helps to reduce the amount of trash produced and food wasted (our eyes are often bigger than our stomachs! ), as well as the resources that would be used to wash the trays. Reusable To-Go Containers: In Fall 2018, UofL Dining brought back the reusable to-go option that was first piloted on campus in 2015-16. For $20, anyone can buy into the program and they will receive a reusable tote bag, bottle, and to-go clam-shell container which they may use at The Ville Grill. Patrons will simply return their container to The Ville Grill for washing and pick up a new one. Memberships in the program are available at The Ville Grill registers. Food Donation: When available, UofL Dining donates left-over food to the needy. This practice began many years ago with donations to The Lord’s Kitchen and Wayside Christian Mission. 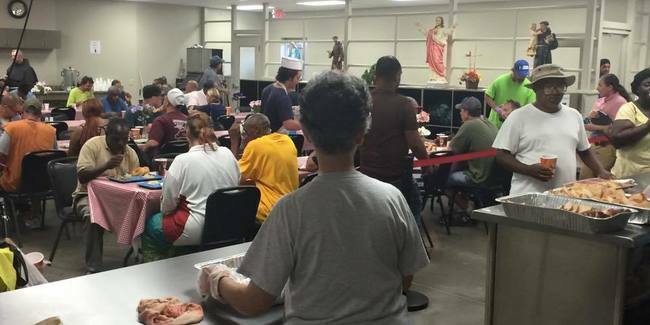 In 2017, UofL Dining began a new program through the Food Donation Connection to supply leftovers to the Franciscan Kitchen in Louisville's Smoketown neighborhood. UofL Dining also supports the efforts of student volunteers expand the capture and distribution of leftovers through the UofL chapter of the Food Recovery Network, which was established in 2018. Recycled Napkins: We use napkins made of 100% recycled materials at all of our dining locations on campus. In 2018, UofL students organized a combined effort to address food insecurity and food waste on campus. In spring 2018, students piloted and then formally chartered a UofL chapter of the Food Recovery Network, a national student-led effort with 230 chapters aimed at combating hunger and food waste. Volunteers collect leftover food from campus dining and catering events and deliver it to local charities that work to feed the hungry. Meanwhile, throughout 2018, students and staff began organizing to address the growing issue of food insecurity on campus. After considerable planning, a small, under-utilized space was secured on the third floor of the Student Activities Center (SAC) for a campus food pantry. Known as the Cardinal Cupboard, the pantry had a grand opening in SAC W303C on January 31, 2019. The pantry is stocked by donations and recovered food. It is staffed by one paid student employee and volunteers. In just its first month of operations, the pantry distributed over 700 pounds of free food to students and employees in need. UofL Dining is committed to doing the right thing. One way we are actively supporting this commitment is by ensuring that all of the coffee served at UofL's campus dining facilities is Fair Trade certified. All P.O.D. locations on campus offer both Fair Trade coffee and chocolate. Fair Trade certification ensures that producers are treated fairly and paid a fair wage for their products. Fair Trade also involves a more direct relationship between the producer and the purchaser, to reduce the amount of profit absorbed by middle men. UofL supports Fair Trade and we seek to provide even more Fair Trade options in the future. Ordering Food? Get it delivered by UofL grads who launched Louisville's first hyper-local, environmentally-friendly, low-cost food delivery service: Arrow Food Couriers. Ordering food for a campus event? Why not use the occasion to highlight delicious, fresh, seasonal, sustainable food from our region? 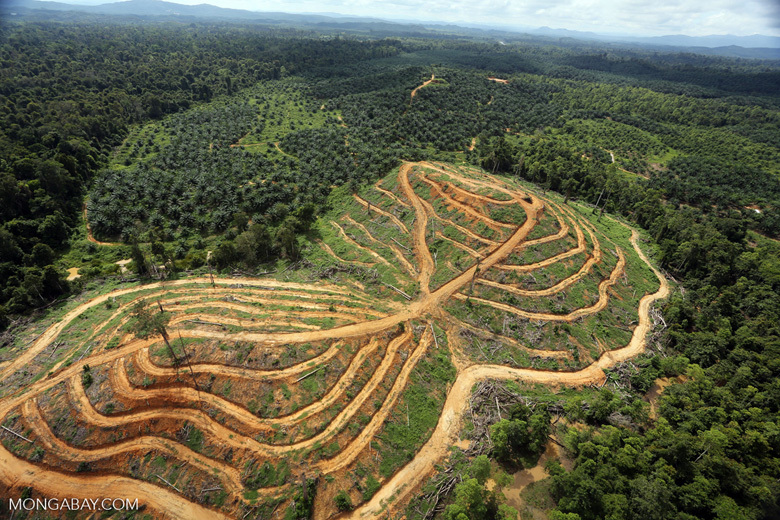 It won't necessarily cost you more, but it will definitely cost the planet less. UofL Dining Catering offers great local food options throughout the year, as does Farm To Fork Catering, and many other area caterers. Find Louisville Caterers using local food here. Reduce your impact even more and enhance the healthiness of your offerings by requesting low-meat or vegan catering. No matter who you hire, just remember to ask for local!...and as few disposable items as possible. No bottled water or styrofoam, please! UofL Continues It's Growth - In The Garden! You can help grow food right here on UofL's campuses! Our largest food garden is the Garden Commons at the Cultural Center, but our Belknap campus also features the Urban & Public Affairs Horticulture Zone behind Bettie Johnson Hall at 426 W. Bloom St. Both are community spaces open to all students, faculty, staff and community members for learning about organic urban agriculture, more sustainable food systems, and building resilient community. Come on out and get your hands dirty...in the most delicious way possible! Learn more here. What's in Season? Check the Kentucky Proud Produce Guide! Grocery Store Tours - Learn how to buy FRESH, AFFORDABLE and REAL food at your local grocery store! Cooking Workshops - Learn from a local chef how to prepare meals using student-friendly recipes. 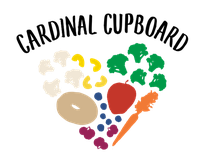 Mindful Eating Workshop Series - learn and practice strategies to apply mindfulness and meditation to eating and food choices. The food you have on hand largely determines how healthfully you will eat. So wisely stocking your pantry is a step toward your good health! Centerplate, which provides food and beverage services at UofL athletic venues, agreed to purchase at least $50,000 of Kentucky Proud products in 2016, such as Kentucky-grown popcorn and local meat and cheese. Products include Kentucky Proud popcorn, grown by western Kentucky farm families and processed by Preferred Popcorn; burgers from The Chop Shop of Wolfe County and Omni Meats of Bowling Green; meats from Brooks Meats of Walton; and Kenny’s Farmhouse Cheese of Barren County. The products are available at Uof L athletic events at Papa John’s Cardinal Stadium, the KFC Yum! Center, Jim Patterson Baseball Stadium and the University of Louisville Golf Club. 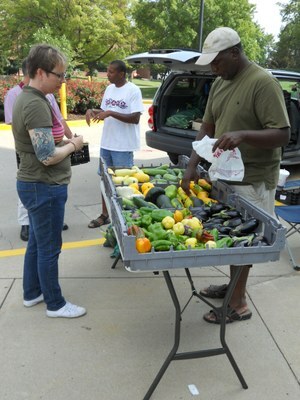 UofL launched a weekly Farmers' Market on Belknap Campus in May 2014. 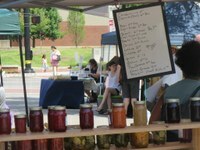 In its first three years, the market ran on Thursday afternoons from May to October on Brandeis Ave. in front of The Ville Grill. The market offered a wide variety of farm-fresh local products, including fruits, vegetables, eggs, meats, prepared meals, baked goods, honey, popcorn, granola, canned goods, natural home & body care products, crafts, and more. The Office of Health Promotion & Get Healthy Now also participated to provide healthy local food samples, cooking demos, and healthy-living tips. Unfortunately, the market struggled to sustain a steady customer base throughout the summer months. After a year off to regroup, the market returned at a new time and place in 2018: Wednesdays, 11am-2pm, Red Barn. We experimented with skipping the hot summer months when it had been difficult in past years to sustain a market without a consistent population on campus, by holding a one-month Spring Market (April 2018) and then a Fall Market (Aug. 15 - Oct. 24, 2018). While the Spring Market went well, we had to cancel the planned Fall Market due to an insufficient number of vendors willing to attend. At the Spring Market, shoppers were encouraged to stop by for farm-fresh local products, including fruits, vegetables, eggs, breads, honey, popcorn, jams, pickles, reusableitems, clothing, linens, pottery, plants to start your garden, and more. 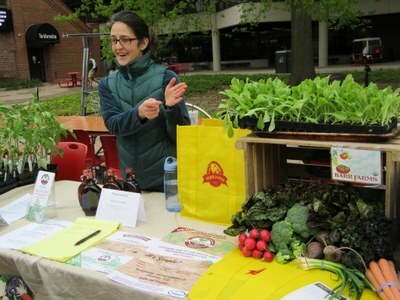 Some farms were also on-hand to accept sign-ups for Community Supported Agriculture (CSA) subscriptions with weekly pickups on campus throughout the summer. The Belknap Farmers Market also continues to organize the popular annual UofL Farmers' Market Holiday Bazaar in the Red Barn each year in late November. This one-day Holiday Bazaar features 17 different local artisans, farmers, and food producers coming together in one location for holiday shopping, local style! You'll find unique holiday gifts such as jams, salsas, relish, honey, baked goods, wreaths & holiday decorations, soaps & balms, crafts, jewelry, stoneware, pottery, UofL apparel and accessories, and more! There are door prizes and lunch available for purchase. For the time being it seems as though the Belknap Farmers Market is most successful as a one-day Spring Market in April and a one-day Holiday Bazaar in November. You can email us comments/questions and follow us on in order to stay abreast of future markets. In 2013, we were able to offer an expanded, year-round Community Supported Agriculture (CSA) program in partnership with the now closed Grasshoppers Distribution which provided weekly deliveries at the University Club parking lot on Thursdays 4-5pm. The now closed, all-local Root Cellar green grocer also sent its mobile market - The Root Mobile - to campus for walk-up purchases and special deliveries in coordination with the CSA deliveries. You did not have to be a weekly subscriber to place individual orders through Grasshoppers' highly flexible a la carte system that provided weekly deliveries of local produce, diary, eggs, cheeses, bread, sweets, pasta, beef, pork, poultry, specialty meats, condiments, prepared foods, teas, and locally-roasted coffee. With the sudden closing of Grasshoppers in late 2013, this was no longer be an option. Grasshoppers Distribution (Louisville distributor for multiple area farms) offered weekly drop-offs at University Club parking lot on Thursdays 4-5pm beginning June 6, 2013. You did need not be a weekly subscriber to place individual orders through Grasshoppers' highly flexible a la carte year-round system that provided weekly drop-offs of local produce, diary, eggs, cheeses, bread, sweets, pasta, beef, pork, poultry, specialty meats, condiments, soups, teas, and locally-roasted coffee. Joe Trigg's Farmers2City Connection (F2CC) CSA (Glasgow, KY - Barren Co.) offered Thursday 4-5pm drop-offs at Lutz Hall circle May 30 - Sept. 12, 2013; Full-share $22/wk, Half-share $12.50/wk; Questions: Joe Trigg 270-303-1244, joetrigg@yahoo.com. Finger Picking Farms (Palmyra, IN) Offered UofL drop-offs and possible home delivery; Full-share $20.50/wk, Half-share (every other week) $11.36/wk; Contact: Nicholas Posante 502-287-8206, treeclimb08@yahoo.com. EpiCurious, Hemmer Hill Farm (Crestwood, KY) Offered Thursday drop-offs at the University Club circle; Full-share $21.74/wk, Half-share (every other week) $13/wk; Contact: Joyce Keibler 502-228-3860, joyce@hemmerhillfarm.com. Each year UofL invited students, staff, faculty, and the public to directly support local farmers through our CSA program. Customers subscribed to a CSA in the spring, providing farmers with much-needed income at the beginning of the growing season, and then share in the bounty of the harvest. Options for farm-fresh food baskets included not only fresh vegetables and fruits, but mushrooms, meats, cheeses, eggs, and more. Full shares started as low as $20.50 per week. Lower-cost/quantity half-shares started at $11.36/wk are also available, or some customers split a share with friends. Connect with other subscribers and find more information at the UofL CSA Facebook Page. The program helped support our local economy, promoted healthy eating, and reduced the environmental impact of transporting, processing, and packaging food from far away. Humanely-raised Meat & Eggs: We have sought to source meat from humane producers in the past. For instance, all of the beef served at the former Cardinal Burger Company (SAC 2nd level, 2013-15) was sourced from Marksbury Farm in Garrard County, KY whichprovides not only local, but pasture-raised, grass-fed beef with no artificial hormones or steroids. In 2014, UofL's former Dining Service provider, Sodexo made a commitment to only source cage-free shell eggs. In Feburary 2015, Sodexo released its Global Animal Welfare Policy, outlining a phased approach to sourcing poultry, beef and veal from suppliers and fostering improved animal well-being through its supply chain. Read more. See an infographic summarizing Sodexo's Animal Welfare Policy. Zero-Waste Reusable To-Go Club: In 2015-16, UofL Dining piloted a new take-out service in truly sustainable style – without adding to the waste stream!! Ville Grill To-Go Club memberships could be purchased in person at The Ville Grill for just $10. Membership earned you a reusable container, unlimited washing of the container and compostable cutlery & napkins, should you need them. This program struggled to gain traction and we are exploring zero-waste take-out options for the future. Local Farm Profiles: Read profiles of some of our past local food suppliers, including Grateful Greens, Creation Gardens, Bourbon Barrel Foods, and Marksbury Farm. 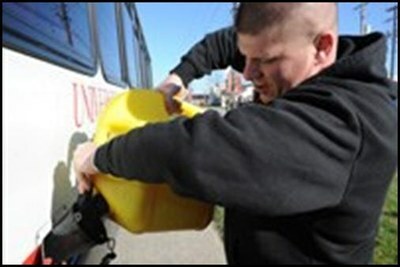 Waste Cooking Oil to Biodiesel: In 2009 Chemical Engineering faculty and students became involved in the conversion of waste vegetable oil from UofL Dining services into biodiesel used to fuel our campus shuttle. In 2011, we experimented with scaling-up this effort as UofL Dining supplied even more used cooking oil for local conversion into biodiesel. The project began through a partnership with the now defunct Louisville Biodiesel Cooperative and then Kelley Green Biofuel of Goshen, KY (5100 Greenhaven Lane), a community-scale, ASTM-certified, National Biodiesel Board registered biodiesel producer with an annual capacity of 75,000 gallons, located just 30 miles from campus. Check out the details of the project here. Currently our waste cooking oil is collected for repurposing by Griffin Industries and only a small percentage is converted to biodiesel. UofL is Kentucky Proud! Beginning in 2010, the university made a push to make Kentucky Proud products available not only in our dining halls and farmers' markets, but in our campus stores, as well. On April 6, 2010, UofL President James Ramsey, Kentucky Commissioner for Agriculture Richie Farmer, student leaders and other university officials cut the ribbon on a new Kentucky Proud store in the former bookstore at Swain Student Activities Center. The Nest, a former convenience store in Louisville Hall, also featured Kentucky Proud products made right here in the Commonwealth of Kentucky.